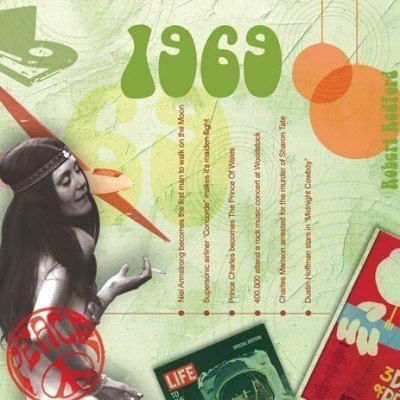 The Classic Years 1969 CD. Birthday or anniversary. The CDCard includes a 20-track compact disc that features an all new music selection with many of the top artists and biggest hits of the Year. An ideal card and gift in one for birthdays, anniversaries or any Special day. Please see below for the full track listing of the 1969 CD. 1. Simon & Garfunkel - The Boxer. 2. Bob Dylan - I Threw It All Away. 3. Nilsson - Everybody´s Talkin´. 4. Elivs Presley - In The Ghetto. 5. Chicken Shack - I´d Rather Go Blind. 6. Johnny Cash - A Boy Named Sue. 7. Sly & The Family Stone - Everyday People. 8. Andy Williams - Happy Heart. 9. The Love Affair - Bringing On Back The Good Times. 10. Fifth Dimension - Aquarius/Let The Sunshine In. 11. LaBelle - I´m Gonna Make You Mine. 12. Nina Simone - To Love Somebody. 13. Blood, Sweat & Tears - You´ve Made Me So Very Happy. 14. Johnny Nash - Cupid. 15. Box Tops - Soul Deep. 16. Roger Whittaker - Durham Town. 17. Zager & Evans - In The Year 2525. 18. Clodagh Rodgers - Come Back And Shake Me. 19. Jim Reeves - When Two Worlds Collide. 20. Georgie Fame - Seventh Son.